The friendly team at Pelican Landing Dental works hard to make sure every patient feels welcome and comfortable throughout their time in our office. However, we know there are some patients who experience more advanced dental phobia or anxiety. Even the kindest and gentlest care may not be able to relieve this stress or phobia. 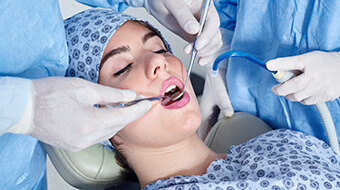 For these patients, those who need advanced care, or those who have difficulty numbing with local anesthesia alone, we may recommend dental sedation. Please call our team to find out more or schedule an appointment. Using a common medical sedative, we can help patients achieve an advanced state of comfort and relaxation. At a predetermined time prior to your appointment, you’ll simply take the medication prescribed by one of our knowledgeable dentists. Within an hour, the effects of the sedative will be felt, and by the time you reach our office, you’ll already be very relaxed. For patients with dental phobia that makes them hesitate before leaving home for their appointment, oral sedatives may be the perfect solution to their dental fears. This long lasting form of sedation will remain in effect for several hours after treatment, so you’ll need to have a trusted friend or family member drive you to and from your appointment. Don’t plan to resume daily activities until at least 24 hours following your initial dose of sedative. As the name oral conscious sedation implies, you will likely remain awake throughout treatment, but you'll be completely relaxed and pain-free. Additionally, you are unlikely to remember any part of your visit.